The mission of ACT3 takes me to many cities and communities, to meet with leaders in private as well as large and small groups of earnest Christians from many churches. Some of my most enjoyable work is building relationships with some of the most interesting and mission-focused leaders that I’ve ever had the pleasure of sharing my life-journey with as partners. Such was the case again because of a visit to the Phoenix area, January 16-21. Over the next few days I plan to share this mission with friends by means of these blogs. I ask you to share in the joy of what Christ is doing and to pray for me as I seek to be faithful to God’s John 17 call upon my life. On Saturday, January 17, I spoke at a Phoenix-area John 17 Movement meeting hosted by Catholic Renewal Ministries of the Diocese of Phoenix. 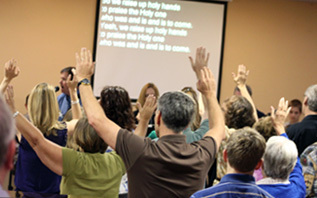 Catholic Renewal Ministries (CRM) is a ministry organization that provides a variety of services to parishes and prayer groups across the Phoenix diocese, including: seminars, retreats, conferences, healing masses, praise nights and other devotional resources. CRM can best be described as an association of clergy, religious and lay individuals seeking to live in growing awareness and fullness of the gifts, grace and power of the Holy Spirit, and seeking opportunities to use their God-given gifts in the service of others. CRM comes under the headship of the diocese through a liaison appointed by the Bishop of Phoenix. 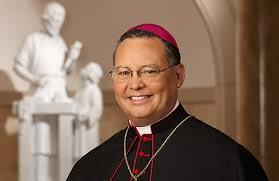 The current liaison is Auxiliary Bishop Eduardo A. Nevares. Bishop Nevares is the CRM Liaison for both the English and Spanish speaking organizations of CRM. CRM is affiliated on the national and international levels with the International Catholic Charismatic Renewal Services organization (ICCRS). 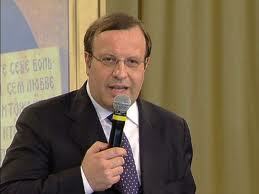 ICCRS maintains an office in the Vatican that is led by another friend, Matteo Calisi. I’ve not personally met Matteo yet but we have begun to correspond with one another since I returned home from Phoenix. Matteo Calisi (photo at left) is a man deeply committed to the ecumenical vision of Saint Pope John XXIII. As a man of faith in the power and gifts of the Spirit he prays and seeks the unity of Christians around the world. Matteo lives and works in the Vatican and directly serves Pope Francis and the global Catholic charismatic movement. ICCRS has a national office and regional representatives within the United States via Chariscenter USA, with a National Service Center (NSC) in support of various diocesan CRM organizations across the USA. This Spirit-drenched ministry unites Catholic and non-Catholics in some uniquely powerful ways. Take the time to learn more. Then pray if you are so led. During the weekend of January 17-18. I was asked to share my unity story at City of the Lord. City of the Lord is a Catholic, charismatic, lay community whose members are called to a covenant relationship with God and each other. Covenant communities such as City of the Lord are recognized by the Catholic Church as a work of the Holy Spirit and a legitimate expression of renewal. They were welcomed and encouraged by Saint Pope John Paul II and the Pontifical Council for the Laity. The City of the Lord initially came into being in response to a great outpouring of grace that occurred in the Catholic Church in the 1960’s. Many deeply earnest and devout Catholics experienced a renewal in the Holy Spirit. They testified to a new awareness of the reality and presence of Jesus Christ as their Lord and Savior, and to a release of the power and gifts of the Holy Spirit. This movement has grown and the Catholic Church has officially encouraged it, even more so in recent years and especially through the influence of Pope Francis. My visit to the gathering at the City of the Lord (chartered in 1977) was to share my story of John 17:21 unity at a Saturday evening gathering. The service was led by another new friend Peter Poppleton. 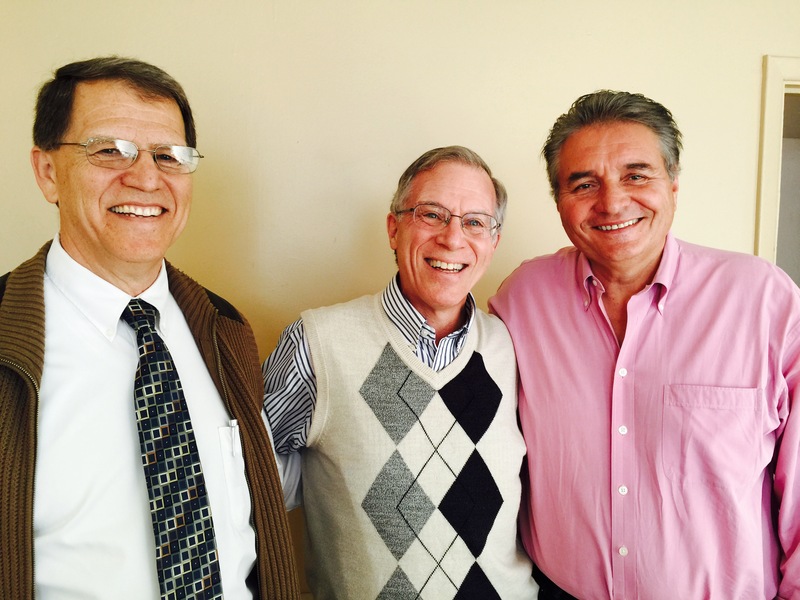 Peter (on my left in this photo with Joe Tosini on the right) is a gracious Spirit-filled Catholic leader who serves as president of the City of the Lord. I spoke freely and joyfully to about 150 people that evening and was received with great joy and love. After I spoke to the gathering, of what is called a John 17 Movement, Bishop Eduardo A. Nevares shared. He greatly ministered to my spirit. After this service concluded I then had a lovely time over pizza with Bishop Nevares, Peter Poppleton and his wife, Joseph Tosini (my host), Douglas A. Remy, an evangelical Protestant business leader in the Pinnacle Forum in Phoenix, and Gary Kinnaman, another evangelical leader, along with his wife. (I think I did not leave anyone out but if I did please forgive me all of you who are my new friends!) I was particularly intrigued to learn about the Pinnacle Forum, a mission that aims at transforming business leaders in order to transform culture. The vision of Pinnacle Forum greatly encourages me in my own work of missional-ecumenism. A strong impression has been forming in me in recent months and this impression was deeply enriched by my time in Phoenix. I believe that the unity I pray for will increase powerfully through godly business leaders, both young and old. Without the encumbrances of church institutionalism such men and women wield an amazing influence for change. (I am not putting down clergy. After all, I am an ordained minister of Word and Sacrament myself.) What I am observing is that leaders in the world of business understand the opportunity for unity in amazing ways and they have the skills to bring about deep change. I am reminded that one of America’s greatest renewals came through businessmen, in the nineteenth century, just prior to the Civil War. If you are a pastor or priest I encourage you to get to know business leaders and learn how to shepherd their hearts for unity in Christ’s mission. These men and women get this vision very quickly and are clearly poised to make a real difference. Matthew Williams liked this on Facebook.